Depth of hold 33' 6"
Propulsion: Two 1,300ihp steam engines, two shafts. 141k Ready for launching at the Bethlehem Shipbuilding Company shipyard, Sparrows Point, Maryland, on 15 February 1919. With a full load of fuel oil, Hoxbar sailed from New York on 21 June, arfiving at Ponta Delgada, Azores, on 1 July. After refueling various U.S. destroyers based there, she continued on to Brest to service other American ships She left Europe on 15 July and sailed to Port Arthur, Tex., via New York, arriving 3 August. At Port Arthur Hoxbar took on another load of fuel oil and on 9 August sailed for Scotland. At sea her orders were changed and she reset her course for Hampton Roads, arriving 16 August. 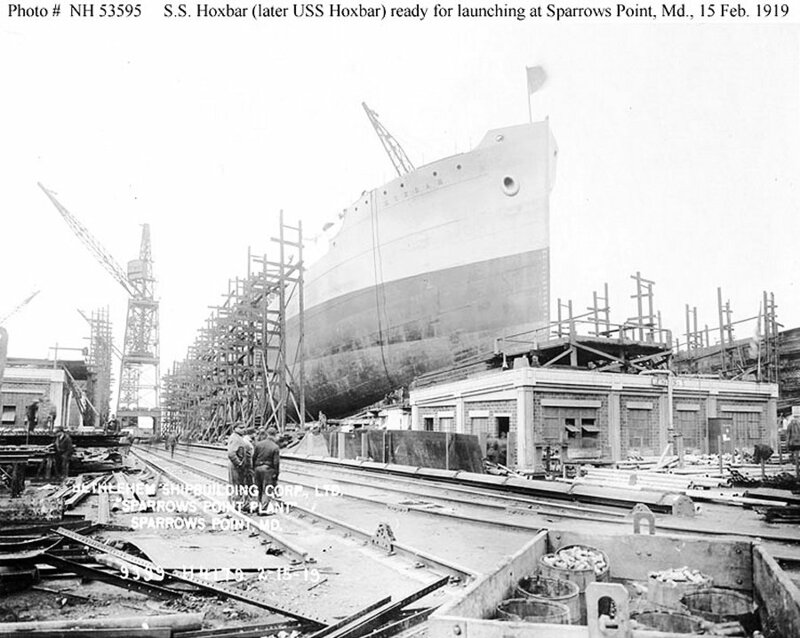 After discharging her cargo Hoxbar decommissioned at Newport News on 28 August 1919 and was redelivered to USSB. In 1925 she was sold to Malston Co., Inc., Wilmington, Del.